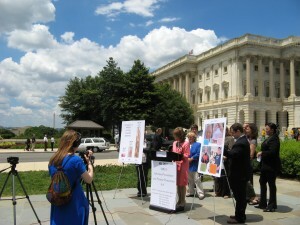 The above link is coverage of the event in Washington DC with Congresswoman Jackie Speier, who introduced a MRSA prevention bill on June 24, 2009. I participated in this event by telling my fathers unfortunate story. Others present had suffered with MRSA and survived or they had lost someone to MRSA. This event was very important to me and to MRSA prevention. 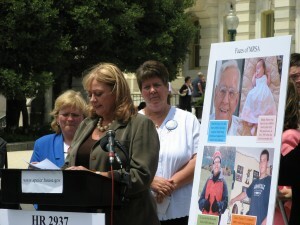 I networked with others who have done advocacy for MRSA victims and with those who had lost loved ones because of MRSA. This bill will stop the scourge of MRSA in our hospitals with screening, isolation and precautions. Please contact your State representatives to support this bill. I was invited to Washington DC to help Rep Jackie Speier introduce a new federal bill to mandate steps to stop MRSA in our hospitals. 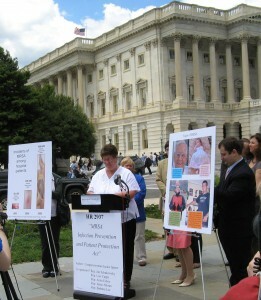 Jeanine Thomas of the MRSA Survivors network told Rep. Speier’s assistant about my father. I told them both that I was willing to make the trip to DC to breifly tell about Dad because it is important to do this. It is important to me, and to anyone who has had MRSA or has lost a loved one because of MRSA. It is important to every patient who enters the hospital in the future. It is important to everybody. I admire Rep Speier for bringing this timely and necessary bill forward. Each State is getting stimulus money for programs to help stop Hospital Acquired Infections. The word is out about our hospitals and most hospitals are not doing the best they can. Active Detection and Isolation is what they need to do. If Rep Speier’s bill passes, all hospitals will be doing just that. So, I am camped outside of the city at Lake Fairfax County Campground preparing to be at the Capitol on June 24 to help bring this bill out. I have to say……..this is a lovely area with so many things to see and do…..but it’s a little humid and drippy for my taste. Maine weather suits me best. The question I am asked repeatedly is why aren’t families told to use the same precautions as the hospital staff do when the patient has MRSA. I’m not 100% sure I can answer that question because I wondered the same thing. When I helped to care for my father while he was infected with respiratory MRSA, for the first 6 days after he was admitted, there were NO precautions. That was because he was not diagnosed for that entire time. Fortunately, both my mother and I, who visited most often, wore clean clothes every day and we didn’t go throughout the hospital to the cafeteria or other rooms. We only went back and forth to the hospital. We did not carry MRSA into the hospital and we did not carry it around to other parts of the hospital, although it was a possibility before we were aware and alerted to Dad’s infection. I believe an accurate answer for visitors of MRSA patients, would be if you are going to be giving care and your clothes are going to be touching the patient or their environment, you should be following hand washing, gloving and gowning exactly the same as the staff. The nursing staff should instruct you on correct procedure for this and you should do this to protect yourself. My family all learned meticulous hand washing before gloving and then washing before we left the room. WE also wore masks while visiting, after Dad was diagnosed with respiratory MRSA. Then there is the question of small children visiting. I think that we need to revisit the days of not allowing small children to visit in hospitals. Many of them, in fact most of them are either in pre schools or day care situations. MRSA is common in those places. If a child is not old enough to learn precautions with MRSA patients, they should not be allowed to visit. It amazes me the number of patients who feel that the hospital room is an appropriate place for a social gathering. Small children are allowed to crawl on the floors and climb on furniture, and get itno things. This is unacceptable in hospitals. These activities are a risk to the child and also to the patient because of what the child may be carrying. There is no standard approach to these precautions for visitors. Maybe it is time for one. Anyone who is going to participate in caring for the MRSA patient needs to use the same precautions as the staff, assuming the staff is using the appropriate precautions. Visitors who are just stopping by to say hello should at least wash their hands and use gloves and avoid physical contact with the patient and their surroundings. And they should always check with the nurse before entering the room in case additional instructions are necessary. My proposal, LD1038, addressed MRSA reporting. My intent with this reporting was to make MRSA a reportable infectious disease in the State of Maine, and also to make hospitals accountable for the number of vulnerable patients who become infected after being hospitalized. So, my hope was to have two categories of MRSA positive cultures for reporting purposes, “Positive on Admission” or Positive while hospitalized”. There is a big difference here. It is believed that over 80% of MRSA infections are healthcare related. It is time to hold healthcare providers accountable for the infections people acquire while in their care. 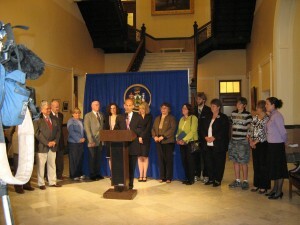 During the Health and Human Services committee hearings, after I made huge concessions on my bill, Maine State Nurses Association and I were given seats in the Maine Quality Forum Infection control collaborative to help make the decisions regarding MRSA and other Health Care Infections prevention. As far as I know, I am a full fledged member of this Infection control Collaborative and so I will readdress the issue of MRSA reporting in future meetings. Essentially at my first (non productive) meeting with the MQF, I was told that there would only be reporting of the number of patients who were determined to be high risk and the number who were screened. This tells the health care consumers nothing. We already know that about 15 to 20% of the general public are MRSA colonized. What consumers want to know is how many full fledged lethal and disabling MRSA infecitons are coming out of our hospitals. What I want to know is exactly that! My father was infected because of lax and inadequate infection control in his hospital. He had no screening on admission and the two other vicitms who died in the month prior to his admission did not have any screening either. So, until they were diagnosed with full fledged lethal and terminal MRSA infections with a clinical culture after they were likely housed with unsuspecting and uninfected patients. I wish I had a way to find out who was roomed with those two other patients, just to see if any of them became infected. My guess is that they did. And so it goes. An undetected infection goes on until it can’t be ignored anymore. In the mean time, unsuspecting and vulnerable patients are roomed with those infected patients, until doctors figure out that the roommate is infected. They become either colonized or infected and then they infect others…on and on it goes. If the MQF has a true desire to stop these infections, they must know first how many there are. It is my opinion that they already do know and that unless MANDATED, they will never reveal or report the true numbers of these infections. I was told that by reporting the infections the way I suggested, “it would not reflect an accurate picture of the problem”. And I suppose their way of reporting WILL paint an accurate picture? I think the problem is huge and they would have to be brutally honest and report all acquired infections for there to be a true depiction of the problem. If the MQF does not bend on this reporting, or on the high risk screening, I will work to get a mandate. There is always January to begin again with proposals and bills and new laws. I am way past the feeling that hospitals are untouchable. My family and I have been personally harmed and my father has been killed by hospital error. He was infected by MRSA and it was preventable. It is time for these publicly funded and operated facilities to answer to consumers, and the public about their inadequacies and then begin the work of effective prevention and reporting in their practices. No longer will consumers sign away their lives on consents that allow hospitals to give them infections and not hold them responsible. No longer will patients tolerate being housed with infected or colonized patients and be put at risk by their hospital for serious life threatening infections. No longer will hospitals be allowed to keep all of this infection mess secret. No longer will they stay at status quo, act liket hey are doing a bang up job and be allowed to continue to kill people in their care. Maine hospitals have a long way to go before they will regain my trust and respect. I hope to help them along with that. 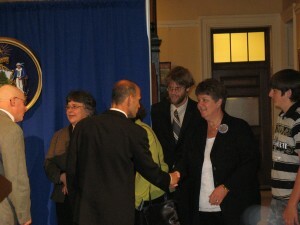 June 10, 2009 at 2pm, Governor John Baldacci celebrated the signing of several Healthcare bills. LD 1038 was amongst those bills. It is a much abbreviated version of the original, but screening of high risk patients for MRSA remains. It will now be law. I will work diligently with the Maine Quality Forum, the same group that fought to get this bill killed, to have an effective and comprehensive MRSA prevention plan ready by October 1, 2009. My hope is to begin screening of high risk patients on admission and during hospital stays on October 2, 2009. This approach will protect patients from getting a serious infection themselves, and it will help to stop the spread of undetected MRSA in hospitals. Patients with positive MRSA tests will be housed separately from those who do not have MRSA. This screening and isolation will decrease the possibility of acquiring an infection while in the hospital. In the hospital we have no control over who we are roomed with. If we go into the hospital, we trust them to room us with somebody who is not a health danger to us. If we are roomed with a MRSA patient, that increases our risk for infection a great deal. We share the same bathroom, sometimes the same phone and other devices in that room. will embrace this approach because they KNOW that the infeciton control practices that their hospitals are practicing today are not stopping these MRSA infections. Active Detection and Isolation is a proven approach to prevent MRSA. Today was indeed a day to celebrate…a new approach to prevention of MRSA in Maine hospitals. I my previous post, I mentioned that humans carry MRSA two ways, colonization and actual infection with the accompanying symptoms, according to what part of the body it affects. So, why is it important to screen hospital incoming patients for MRSA? When we are admitted to the hospital, we have no control over who we are roomed with, how well the housekeepers clean, if the staff washes their hands, or many other safety factors. We can stay alert or ask a friend to and keep on top of those things, but if somebody is roomed with us who has MRSA in their nose or somewhere else on their body, we can’t control that. We are forced into living with and sharing facilities with a stranger, not knowing what they are in the hospital for unless we ask them ourselves. I know of two people who found out their roommates had MRSA and it was only a short time later that they had it too. This is just plain unacceptable. I live with the suspicion that my father was roomed with a patient with MRSA. 3 of his roommates had respiratory infections, all of them with chronic lung problems and at least one of them came from a nursing home. They all predeceased Dad. ALL of them were at high risk for MRSA, but NO SCREENING was done at his hospital and so they do not detect MRSA except when they do what is called “CLINICAL” cultures. Patients are often 4 or 6 or 10 days into their infections before the difinitive diagnosis of MRSA is made and that diagnosis is made with a CLINICAL culture. Then it may be several days (or never) before anybody discloses to the patient that they have it. During that time, no special precautions are taken and the germ is spread with wild abandon. It gets onto the doctors clothing and hands, onto the nurses scrubs, ….it gets carried to the nurses station and onto the computers, off it goes to the Physical Therapy room and into Xray, to the MRI machine and onto the lab techs box she carries, and around and around it goes. No wonder there is inadequate control over MRSA in Maine hospitals. Screening on admission, of high risk patients, will alert the hospital, the caregivers and the patient that they are carrying MRSA. This may be just colonization, but that is significant in and of itself. It means they have no signs of infection, but the germ is growing in thier nose, or a body crease, or open sore or on their skin. And they can spread it around. Large numbers of colonized patients are admitted to hospitals every day that are not detected. This is both a risk to those patients and to the other patients they are roomed with. We can’t continue to keep our heads in the sad about colonized patients. Both CDC and SHEA, the so called experts of disease control, state that colonized patients as well as infected patients need to be isolated and contact precautions used. That means a separate room and handwashing, gloves, gowns and masks (as needed) on or between every patient contact. Yet, it is impossible to abide by that recommendation. Why? Because without screening, we will not know if they are colonized. Patients who are colonized with MRSA are at a significant increased risk of getting a full fledged infection. They are also reservoirs of MRSA for spread to other patients, Healthcare workers and the environment. Without knowing who is colonized and enacting the proper contact precautions, MRSA gets spread all over the place and there is no way to control it. We screen, we isolate and we protect…both the colonized patient and the other patients. No MRSA prevention program will work without high risk screening /Active Detection and Isolation. Humans can have MRSA germs two ways. Some of us with healthy immune systems can carry MRSA in our noses or other parts of our bodies and have absolutely no symptoms. The first time we are aware of it is if a MRSA screening culture is done, perhaps before a hospital admission. This carriage of MRSA is called colonization. This form of MRSA is usually found when screening cultures are done and before there are any signs or symptoms of actual infection. Although this form of MRSA is benign, it increases a person’s risk of actual infection about 7 times over. The second way we can have MRSA is during actual MRSA infection with the accompanying symptoms. MRSA can affect skin, bones, hearts, lungs, joints or any other part of the body. Infection usually occurs when the patients is vulnerable because of certain risk factors and/or because of inadequate infection prevention in hospital settings. Certain lifestyles can make one more vulnerable to Community Acquired MRSA, but it is Hospital acquired MRSA that I am addressing here. The signs of infection are according to what part of the body it affects. If it is Respiratory MRSA, like my own father contracted in his hospital, the symptoms can be fever, profound weakness, loss of appetite, somnolence, and coughing with sputum. If the infection is in a wound, the symptoms can be fever, swelling or redness of the wound, drainage from the wound, pain, profound weakness, and loss of appetite. Sometimes if the infection is inside the body because it has been sewn up inside there during surgery, the symptoms are extreme pain, malaise, and fever. This is called MRSA infection. These infections are found by “clinical cultures”. This means the culture is done as a diagnostic measure, AFTER he patient already has an infection. My proposal for Maine LD 1038 was written with the goal of getting Active Detection and Isolation in all hospitals in the State of Maine. This means each and every hospital would have a standard approach to MRSA prevention that starts with MRSA screening of high risk patients. Second step is to isolate those patients who test positive for MRSA. This step is to keep infected or colonized patients separate from patients who do not carry the MRSA germ. Third step is to initiate precautions to include hand washing, gloves, gowns and masks as necessary before and between patient contacts. Forth step is to attempt decolonization for patients who will undergo certain procedures that are known to be risky for acquisition of MRSA infections, such as joint replacements, cardiac surgery, or central line placement. Also, an admission to certain departments in hospital puts patients and higher risk. In addition to the above steps, decontamination of the patient’s immediate area is necessary. My meaning of culture change is one of having the goal be PREVENTION of MRSA rather than REACTION to MRSA. Also, when this approach is proven successful, the staff will develop an “ownership” of the process. Just think how wonderful it will be to be able to tell Maine Consumers that we have dropped the numbers of infections by 30% or 50% or even more in just one year or two. It can happen. It MUST happen. We know the current approach is not working. About 5% of infections…central line infections…. has decreased. That was old news from 2007 that was just recently brought out for bragging rights by the CDC. It is really just a small number of MRSA infections. All reductions of MRSA infections are desirable, but our goal is to have zero infections, in as short a time as possible.